His sire is Bubba Tuff Chex and his dam is Horseshoe J Delicious (over 86" TTT). 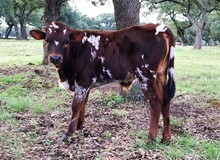 His pedigree is packed with horn and twist genetics out of some fantastic animals. He placed 2nd in Class 8 (out of 17) at the 2017 Southeastern Winchester Futurity. He looks incredible for a bull his age. One of a kind Pedigree !!! Much appreciation to James and Lynette Haltom for Breeding this Great prospect and giving Helm Cattle Company this opportunity, the Good Lord willing you will hear and see much more on this young Bull in the days to come !! !